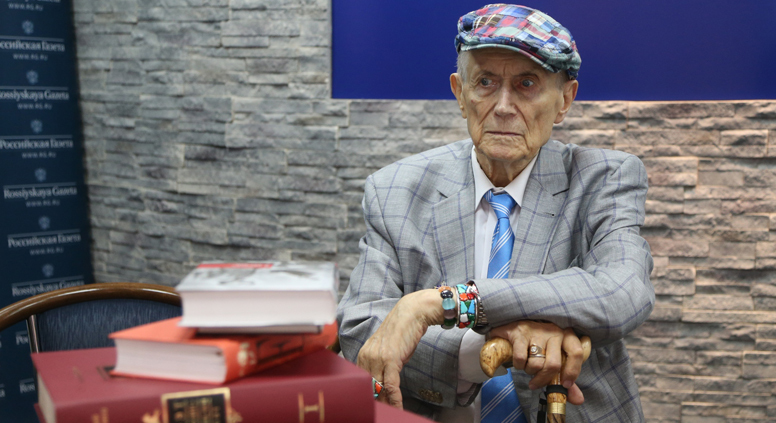 In recent months, Yevgeny Yevtushenko, one of Russia’s finest living poets, has toured around 50 cities, giving poetry readings from Moscow to the Russian Far East. Despite being 83, he flew to Germany and Yakutia, and then back to Moscow. On Sept. 19, he will give a reading at the Brooklyn Public Library, and in early October, he will perform at the Luzhniki Stadium in Moscow. Rossiyskaya Gazeta: This year has been declared the Year of Literature. This is the state showing that it wants to help Russian literature. But how should we do this? Yevgeny Yevtushenko: My answer is very simple – we must reach out to ordinary people. Our intelligentsia simply does not understand how detached it is from the general public. I have travelled across Russia giving readings of my own poetry alongside recitals of great works by famous actors, and the venues were packed everywhere. RG: What was the longest poetry reading in your life? Y.Y. : In 1963, when I read my long poem, Bratsk Station, in full before an audience of workers. It was a venue for about 800 people, but they put speakers out on the street, and people stood and listened there, too. It was a very chilly day in April. I read for four-and-a-half hours without a break. There were children in the audience as well. That was one of the happiest days of my life. What is any Nobel Prize worth compared to that? RG: The title of one of your last poems – The state, be a human! – has become an aphorism. This poem is dedicated to the events in Ukraine, but its meaning is much broader. What should we do today, when political hostility has engulfed the whole world again? Y.Y. : I have always liked the academician Sakharov’s thought about the future convergence of the best ideas created by mankind in its history. This is the most correct and purest way: study all the philosophies and take the best out of them. Do not accept mistakes and injustice, learn not to repeat them, and progress to an “ism” that has not yet been named. But perhaps no “ism” is needed – no special definition for this world order – don’t you think? RG: What kind of relationship should poets have with the authorities? Y.Y. : In my opinion, Pushkin created the ideal image of a poet – both a supporter of the state and a rebel. I think a real statesman should be a bit of a rebel, too – an enemy of bureaucracy, rather than someone who panders to it. Peter the Great had this blend of characteristics, for example. RG: You are sharing the bill with the poet Vera Polozkova at a reading in the Luzhniki Stadium on Oct. 3? Why did you choose her? Y.Y. : Because, like me, she can hold such a large audience.